Presented by Norm the "Yodelologist"
Hello! I am your yodelologist, Norm, I've been yodeling my brains out for 30 years and continue to perform with my band AlpineX. This site was inspired by a meeting with the amazing Franzl Lang at a live performance in Allenbach am Bodensee. I asked him if he gave yodel lessons. He said, "You can either yodel or you can't." I was disappointed because I really wanted lessons from the "Jodlerkönig" (yodel king). I came home and, with my interest in website development, built the first YODELCOURSE in 1996. 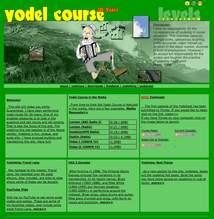 Originally the site was yodelcourse.com, from 1996 - 2004 since then over 1 million visitors tried their hand at yodeling. Now I have redesigned the site and re-recorded the lessons. The course includes beginning yodeling with the basic sounds and the syllables of yodeling. Good luck and have fun! 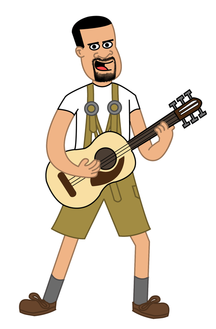 Yodelologist- One who studies and performs the somewhat hilarious art of yodeling. Beginning in the 1970s, Norm became interested in the Bavarian musical art of Alpine yodeling (jodeln). With a German mother and an American father, he found himself traveling back and forth to Bavaria, Germany regularly. During one of these trips, Norm was given a few cassette tapes and a beer by his great uncle Karl. These tapes included one from an artist named Franzl Lang. After hearing the song, Auf die Berg, Auf die Berg, he was hooked. When he is not sporting the latest lederhosen fashion he teaches 3D Modeling and Design at the middle school level. His friends often laugh when he begins teaching yodeling at some local restaurant. He just can't help it, he was born to teach. He brings 20 years of teaching experience to the Internet Yodel Course, as it was called in the 90's. He has taught, through the site and media appearances, over 1 million yodelers. Brian joins Norm and brings his amazing musical talent to the NEW YODELCOURSE. They have been yodeling together for many years. Brian also added the guitar tracks to all the lessons and the second yodel parts on Yodeling with Friends. He is excited to teach yodelers around the world how to yodel. The original yodelcourse site was launched in 1996 when Norm was teaching himself to build websites. Over the years, Norm had many media requests to talk about and teach yodeling. Some of those appearances were for NPR The World, BBC World, CNN and numerous radio stations. Student Yodelers have unlimited access to the entire site including directions, audio files, and videos. What ultimately sets the YODELCOURSE apart from others, is the ability to submit video links of student’s yodeling for review. Norm reviews each submission, and upon completion of all levels, that student will receive a Student Certificate of Yodelology.